NEW YORK (CNNMoney) -- Apple CEO Steve Jobs has resigned and will be replaced by former Chief Operating Officer Tim Cook, the company said late Wednesday. Jobs will stay on as Apple's chairman. Apple made no mention of Jobs' health in its statement about the change, but Jobs alluded to it in the letter of resignation he sent to Apple's board on Wednesday and later released publicly. Apple's (AAPL, Fortune 500) board took pains to praise Jobs, who led a historic turnaround for the once-ailing company. Apple shares were briefly halted in after-hours trading as Apple announced its leadership change. When trading resumed, shares dropped 5%. "Steve's extraordinary vision and leadership saved Apple and guided it to its position as the world's most innovative and valuable technology company," board member Art Levinson said. "In his new role as chairman of the board, Steve will continue to serve Apple with his unique insights, creativity and inspiration." Apple's fans flocked to Twitter and other social-media sites to mark and mourn the CEO torch-passing. "The end of an era!" one Twitter user wrote, while another voiced the fears many share: "I pray it's not bc [because] of his health." In January, Jobs said he would take another medical leave of absence, two years after a six-month sabbatical during which he received a liver transplant. Although it was his third medical leave of absence, he continued to make Apple's major strategic decisions while Cook took over the day-to-day operations. Cook has nearly 30 years of experience in the computer industry, serving in leadership roles at IBM (IBM, Fortune 500), Intelligent Electronics and Compaq before joining Apple in 1998. Jobs made his last public appearance in June when he unveiled iCloud, a free wireless storage and syncing service, at Apple's annual Worldwide Developers Conference. 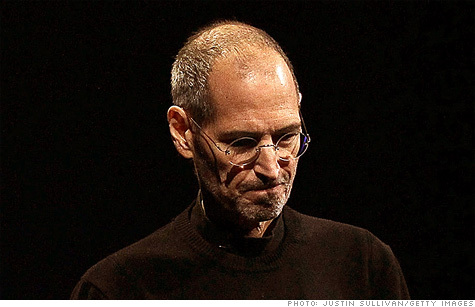 Jobs received a standing ovation when he took the stage. Jobs co-founded Apple with Steve Wozniak in 1976 from his family's garage. Nine years later, Jobs parted ways with Apple after disagreements with management. He returned as a consultant in 1996 and became interim CEO a year later. In 2000, he took the job permanently. In his second run as CEO, Jobs led a Phoenix-like resurrection that transformed Apple from a bumbling also-ran to the second-largest company in the world by market value. Billion-dollar products like the iMac, iTunes, iPod, iPhone, and most recently the iPad have made Apple the envy of all tech competitors. "I believe Apple's brightest and most innovative days are ahead of it. And I look forward to watching and contributing to its success in a new role," Jobs wrote in his resignation letter. "I have made some of the best friends of my life at Apple, and I thank you all for the many years of being able to work alongside you." Six years ago, Jobs delivered his only commencement speech -- one that is often cited as the speech of his life. "Death is very likely the single best invention of life. It is life's change agent. It clears out the old to make way for the new," he told the crowd at Stanford University. "Your time is limited, so don't waste it living someone else's life." It was a powerful talk, given the CEO's history of illness. Jobs was diagnosed with a treatable form of pancreatic cancer in 2004. Since then, both his health and how the company would run without him have been topics of intense speculation. Tim Cook, who will take Jobs' spot, quickly gained the favor of the notoriously hard-to-please CEO. Cook was named COO in 2005 after having "been doing this job for over two years," Jobs said at the time. Jobs even gave him an office near his in Apple's Cupertino headquarters. As COO, Cook has been responsible for Apple's product sales and operations, overseeing the company's manufacturing, distribution and inventories, as well as negotiating with wireless networks that carry the iPhone. He organized Apple's successful retail store strategy, and he is in charge of ensuring that Apple's new products launch without any setbacks or major glitches. Design and marketing, however -- which fell directly under Jobs' purview -- is not Cook's forte. Still, some analysts that follow Apple say they believe Steve Jobs built up a resilient culture over the past 14 years, cultivating strong teams that can continue to innovate without him. Many of those teams pulled off very ambitious projects while he was on leave, including the iPad 2, iOS 5 and the new MacBook lineup. "One of the most important things that Steve Jobs did in Apple 2.0 is rebuilding the culture," said Mike McGuire, analyst at Gartner. "But it's not quite the 'cult of Steve' like many believe. He built incredible teams that didn't quite have free reign, but had plenty of room to innovate. It's going to be hard work, but Apple will be fine without him." Are there Apple products you love (or hate)? E-mail us your story of how Apple gadgets touch your life and you may be featured in an upcoming CNNMoney story.